Wedding Dancing Classes: Broadway Dance Studio offers professional and fun Ballroom, Latin & Salsa classes. Wedding Classes focusing on the dances Waltz, Social Foxtrot, Quickstep & Rumba which are the most suitable for wedding parties. 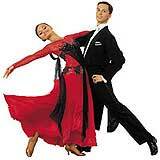 Also suitable for people who want to learn classic ballroom dances. These can be learned in private lessons for couples or groups.